President Mnangagwa has urged stakeholders and the international community to respect the DRC Constitutional Court's decision upholding results of that country's recent presidential election, which was won by opposition leader Mr Felix Tshisekedi. 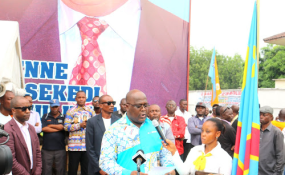 On Sunday, the DRC's highest court affirmed that Mr Tshisekedi polled the highest tally of all candidates (38 percent) in the election, ahead of closest challenger, Mr Martin Fayulu (34 percent). Mr Fayulu has rejected both the election result and the court ruling, threatening protests that could mar the first democratic transfer of power in the Democratic Republic of Congo in nearly 60 years. In a statement issued by Presidential spokesperson Mr George Charamba yesterday morning, the Head of State and Government reiterated his desire to work closely with the incoming administration in the DRC. The statement reads: "Following the confirmation by the Democratic Republic of Congo's Constitutional Court of President-elect Felix Tshisekedi Tshilombo's victory, the President of Zimbabwe, His Excellency Emmerson Dambudzo Mnangagwa, called on all parties and stakeholders in the DRC to respect the decision of the Constitutional Court. "He further called on all parties and stakeholders to continue working for peace, stability and unity, which are critical for sustainable development and a better life for all Congolese citizens." The statement by President Mnangagwa -- who is Deputy Chair of the Sadc Organ on Politics, Defence and Security Co-operation -- "stressed the need by the international community to uphold and respect the sovereignty and territorial integrity of the DRC in conformity with the Sadc Treaty, the Constitutive Act of the African Union, and the Charter of the United Nations". "He reiterated his commitment to working closely with the president-elect and his incoming administration." On January 17, a Sadc Double Troika Summit -- in which Zimbabwe participated by virtue of President Mnangagwa's Deputy Chairmanship of the Organ on Politics, Defence and Security -- said the international community must respect the DCR's sovereignty. A communique issued after that meeting read: "Summit recognised and underscored the role of the Constitutional Court of the DRC and called upon the international community to respect the constitution of the Democratic Republic of Congo and the internal legal and political processes for the finalisation of the electoral process. "Summit also called upon the international community to support the government of the Democratic Republic of Congo to maintain a peaceful and stable environment following the landmark elections, and avoid actions that are prejudicial to the electoral process."